This photo shows only a small part of the Cabin Fever 2010 Model Engineering Show in York PA. I couldn't find a good vantage point where I could take a picture that would show how big and well attended it was. 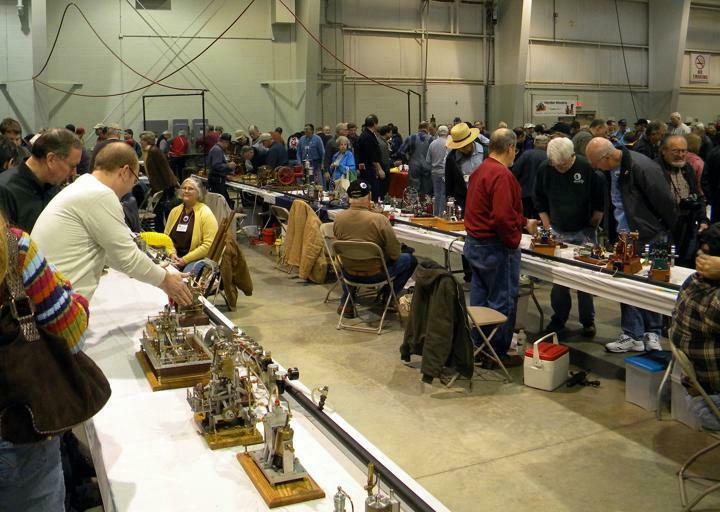 Last weekend I attended my first model engineering show, the 14th Annual Cabin Fever Expo in York PA. It’s a three-day event but I was only there on Saturday, which is when most of the exhibitors are there and when most of the seminars are held. The show is one of the largest of its kind and I had a good time. I think any kind of modeler would be welcome to exhibit their work at the show, but it’s dominated by those who make things from metal. So many of those who come to the show are interested in machining and metalworking. There were also many there who were interested in live steam. There were dozens and maybe hundreds of steam, internal combustion, Stirling and other engines on display. Actually, they weren’t just on display. You could see most of them run. The organizers provided compressed air for the steam engines to run on and the internal combustion engines were allowed to run on small quantities of fuel (lantern fuel I think because it burns cleaner and produces a more pleasant smelling exhaust). The Stirling and other hot-air type engines were usually powered by candles or electrical heat sources. There were a lot of trains, especially steam-powered trains. They could be found in all sizes, including some that were more than ten feet long and looked they weighed hundreds of pounds. There was also a lot of track for them to run on. If you’re into model boats you would not have been disappointed. Not only were there plenty to look at, but you could watch them run in an absolutely humongous indoor tank they constructed for the show. Again, many of them were steam-powered. There were other kinds of models to see, like cars, guns and miniature machine tools. Most of the exhibitors were showing things they built themselves. But there were others who were showing things they collected or restored, like old model airplane engines. There were also demonstrations going on throughout the building. The one I found the most interesting was Ron Ginger’s demonstration of Mach 3 and a CNC router that he recently designed and built. Ron also led a seminar on CNC and I learned an enormous amount from him in just a little while. The show’s organizers make it very easy to be an exhibitor and you won’t feel out of place if don’t have something fancy or unusual to show. You just have to pay the regular $10 admission price and tell the ticket seller that you have something to exhibit. In additional to table space and a chair, you’ll get some name and description cards for your exhibit, a chance to win door prizes, and an invite to a meet-and-greet reception after the show on Saturday. By the way, the $10 admission fee was good for all three days and there was no charge for children under twelve. 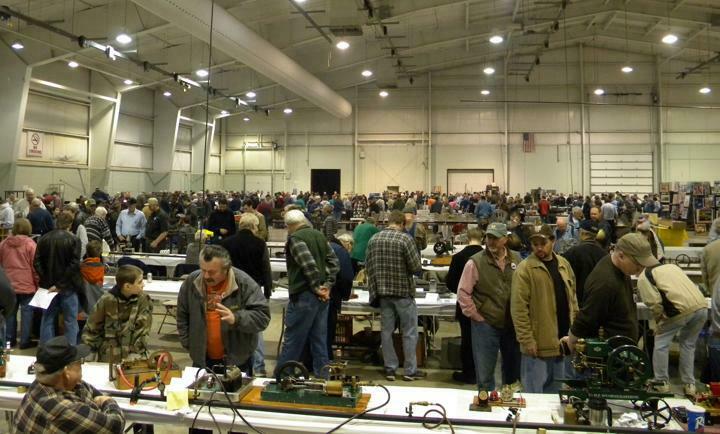 There were also at least fifty or sixty vendors selling metalworking and woodworking tools, models, kits, plans, parts, castings, books, services and many other things, both new and used. Many of them were selling used machine tooling and measuring equipment at good prices, but I didn’t buy any. It was partly because there’s not a lot of things I need, partly because I’m pretty picky when I buy used stuff, and partly because most of the used tooling was too big for my mini-lathe and mini-mill. There were also vendors selling new tooling and equipment, but not as many as I was expecting. I was a little disappointed because I had stopped at the Grizzly Tools showroom near Williamsport on the way to the show and had been really tempted to spend my money there. But I didn’t because I thought I’d find lots of good stuff at the show. I didn’t and I couldn’t go back to Grizzly’s because they’re closed on Sundays. A big steam engine and tender. There were even bigger ones at the show, and much smaller ones also. I did buy some metal. Of course I regretted not buying more after I got home. It doesn’t spoil, prices are likely to keep going up, and I think it’s a good to have a large assortment on hand. The vendors were selling mostly brass and aluminum cut-offs, but the prices were good and one vendor had a large assortment of large diameter rounds and big blocks in sizes that were perfect for things like large flywheels. There was also a lot of train stuff for sale but I can’t tell you much more than that. 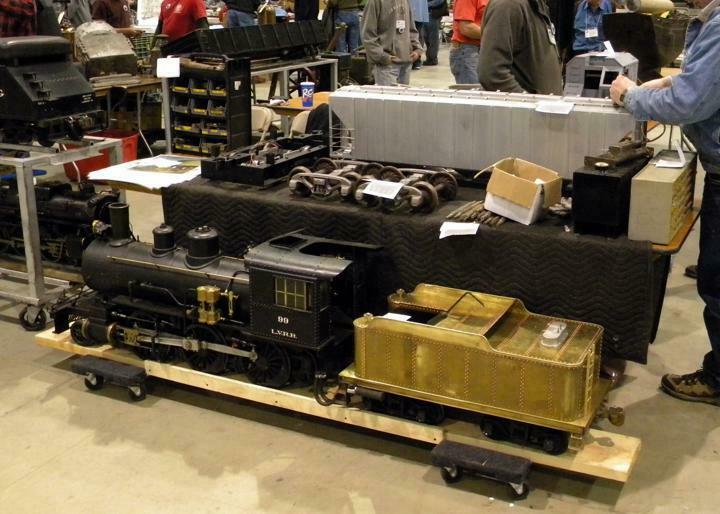 I know model trains are popular and live steam ones are particularly impressive, but I’ve just never been interested in them even though I come from a family of railroad people. I didn’t get a chance to see much of York while I was there or learn very much about it. I do know it is very close to Lancaster where tourism is a big industry, largely because it is located in the heart of the Pennsylvania Dutch (Amish) community. The show took place at the Toyota arena located on the York fairgrounds. It was easy to find, it had ample and clean bathroom facilities and the food was better and more reasonably priced than what I’ve experienced at similar venues. There are also lots of affordable hotels in the area. I stayed at a Homewood Suites for $101 and I found out at the show that I could have stayed at a Hampton Inn for $79 (I like Hilton hotels). I am really looking forward to next year’s show and I’ve already started to think about what I’m going to exhibit. I hope to see you there. 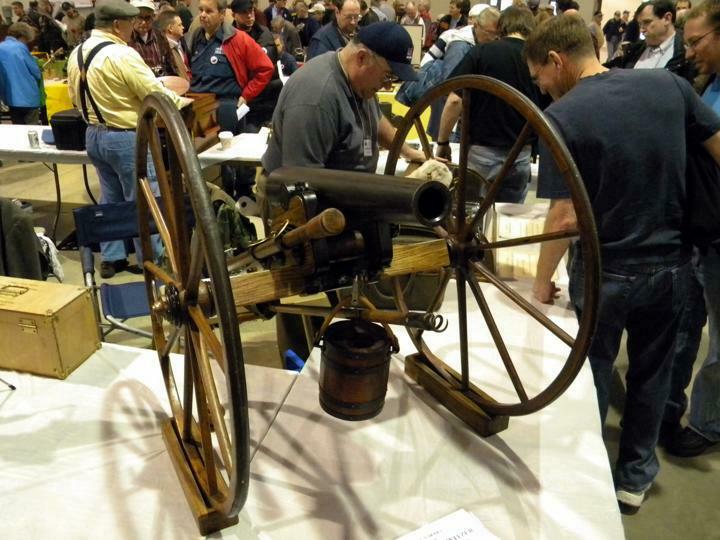 This working 1/2 scale Civil War era Mountain Howitzer can accurately fire a 3-pound projectile about 175 yards on 1-1/2 ounces of black powder. It was built by Barry Navarre of New Tripoli, PA. 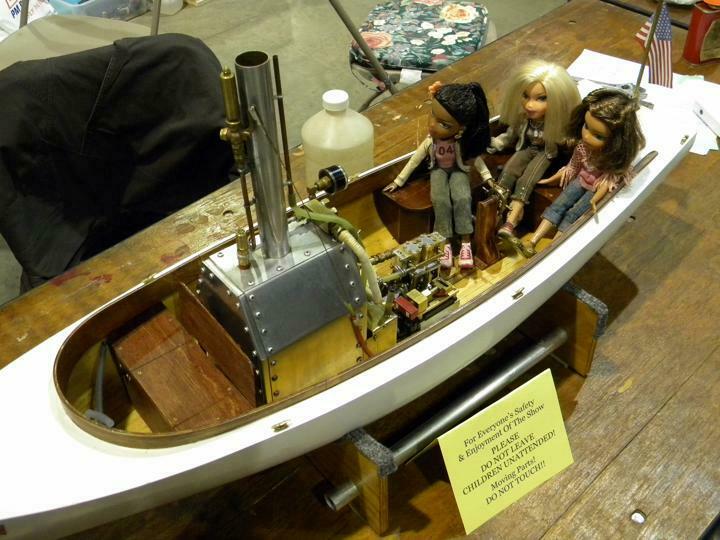 This 3-foot model launch has a scratch built hull and boiler. The two-cylinder motor was built from a kit. 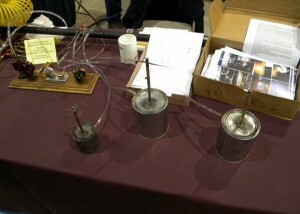 The heat source is a gravity fed alcohol burner that the owner also made. 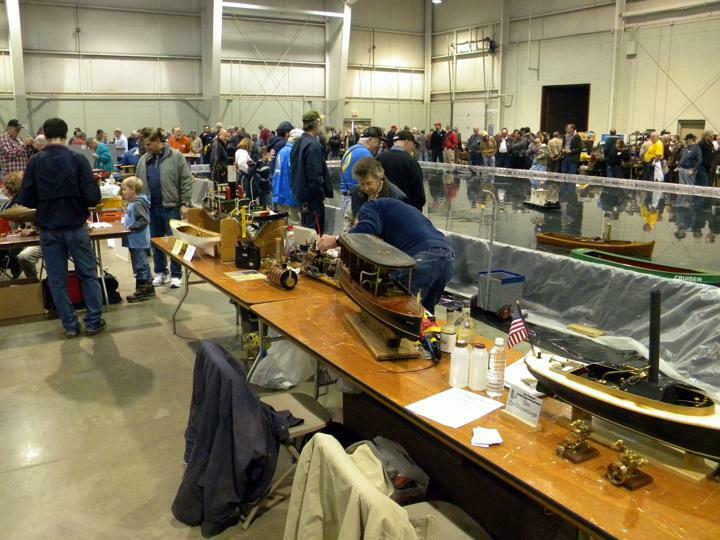 Here are just some of the steam, internal combustion and hot-air powered engines that were being exhibited. Notice the pipes that provided compressed air for the engines that could run on it. The gentleman who made these was trying to get younger people interested in making things. So he was handing out plans and instructions for building a paint can motor based on Hero's engine. I think it's a great idea and I'll be helping a certain eight-year old make one of these soon. I just want to thank LittleMachineShop.com. They emailed me a coupon to get a free USB flash drive at the show. They ran out of them but said they would mail me one, and they did. Unlike my brother, I would have spent more of my time looking at the train stuff. 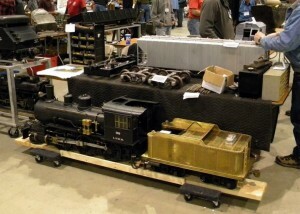 Good picture of the steam engine and tender.